Deutsche Telekom has clinched an exclusive deal with Apple Inc to sell the coveted iPhone in Germany, an industry source told Reuters. The deal will be announced next week, the source said. The touch-screen device, which combines the popular iPod music player, a video player and a Web browser, will be sold through Deutsche Telekom’s retail outlets in Germany at an initial price of 399 euros ($554), the source said. 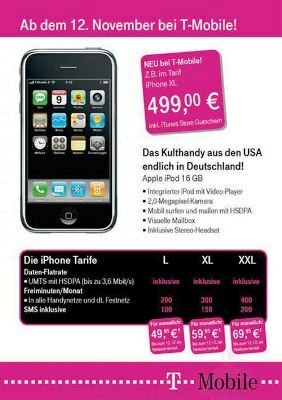 Deutsche Telekom’s mobile communications unit T-Mobile has agreed to share voice and data revenues generated by the phones with Apple, the source said. A T-Mobile spokeswoman declined to comment. This week Vodafone unveiled a range of new handsets and services for the key Christmas period including an exclusive music service offering unlimited tracks, to challenge the iPhone in Britain. Apple is calling a London news conference next Tuesday but has declined to give details. An Apple spokesman in Germany has said only that the company would announce which telecoms operators had won the sales deal by the end of September. Previous Post Todays the DAY!